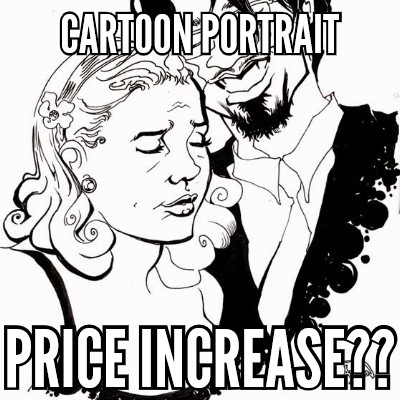 The current base price is $50.00 (plus shipping) for an original Cartoon Portrait, and $35 for a digital-only joint. This will increase to $97 (domestic shipping included) for an Original Cartoon Portrait, and $50 for digital-only. Upgrades have already gone up from $15 to $25. Discounts for Fan Club members will still apply. I will continue to honor prices for anyone in my Custom Art clubs, so long as you keep your membership current. You can still order at the old price until Friday, February 9th.